Our goal is to make sure you leave with a smile on your face! At our office you'll always find friendly, professional staff that will go out of their way to ensure your visit to the dentist is a happy one! Here at Mariola Perkowska DDS dental office our patients come first. We have friendly staff, a clean facility and excellent customer service. We accept all dental PPO insurance plans. Same day emergency appointments. Interest free financing available through Care Credit and Citi Health Card. 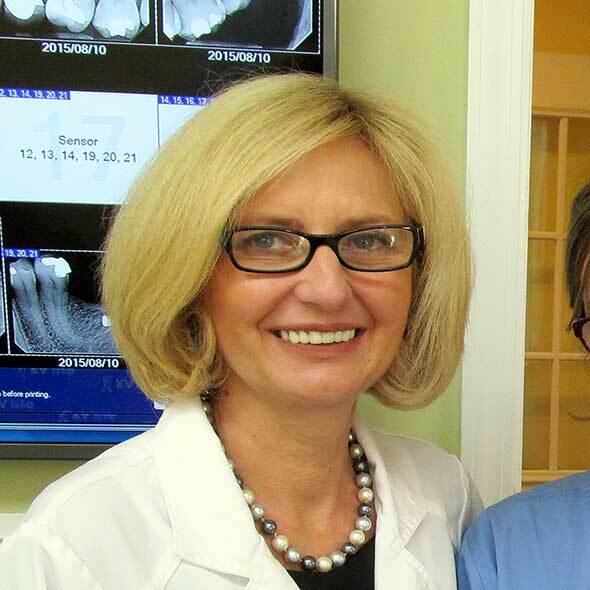 As a woman in dentistry, Dr. Perkowska has a sensitive, personal approach that you are sure to love. Her philosophy is to first establish a relaxed, comfortable relationship with you; she knows not everyone likes coming to the dentist! We understand your feelings and have created an atmosphere that welcomes and calms patients while featuring modern technology for advanced care. Everyone on our team will listen to you with genuine concern, and Dr. Perkowska will sit down to personally talk about your goals and expectations. Progressive technology and modern dental techniques, along with restorations from our quality dental laboratory, allow us to create attractive, durable, comfortable dental work for patients of all ages. Whether you need restorative procedures, orthodontic treatment, dental implants, a smile makeover, or regular, preventive dental care for your family, Dr. Perkowska has what it takes to make you smile. At our dental office, you’ll never be rushed. 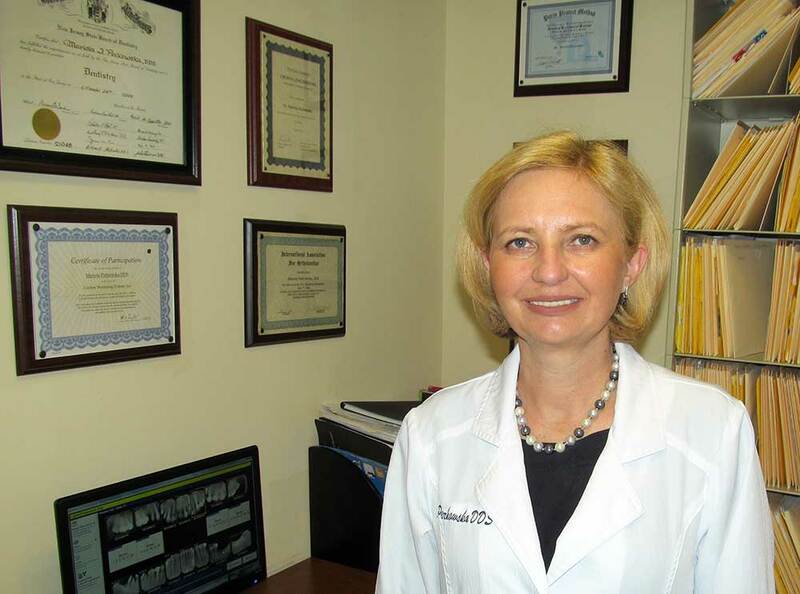 Dr. Perkowska takes the necessary amount of time required for each patient to feel welcome in our office. She’ll discuss your reasons for visiting us, go over your concerns, and answer any questions you may have. If visiting the dentist makes you nervous, tell us. We make patient comfort our #1 priority. Schedule Your Visit - Call today to reserve your consultation or checkup with Dr. Mariola Perkowska. In fact, schedule checkups for the entire family! We look forward to giving everyone you love a reason to smile. On the personal level she is an avid reader, enjoys gardening, travel and outdoor activities such as hiking, skiing and biking. The American Dental Hygienists’ Association recommends that adults schedule dental exams every six months. Regular dental exams are an important part of preventive health care. During a dental exam, the dentist or hygienist will clean your teeth and identify gum inflammation or bone loss. The dentist or hygienist will evaluate your risk of developing tooth decay and other oral health problems, as well as check your face, neck and mouth for abnormalities. A dental exam may also include dental X-rays or other diagnostic procedures. 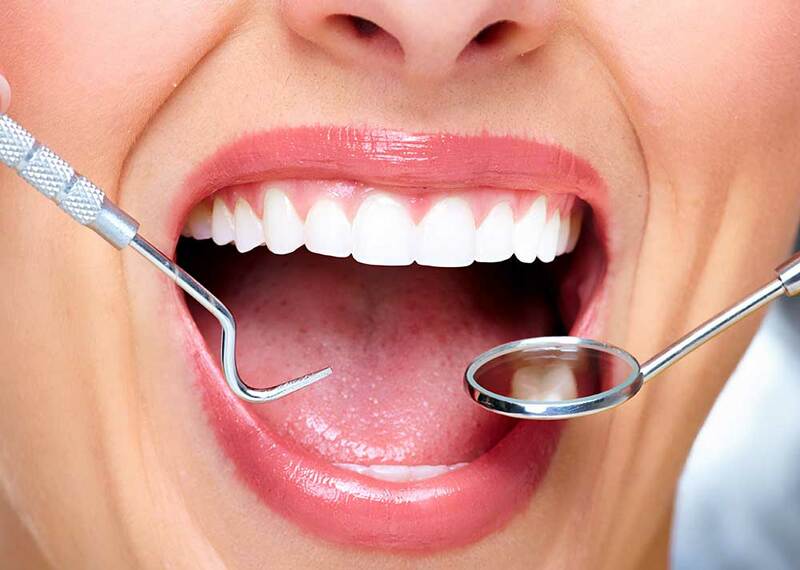 A dental cleaning is a routine dental procedure. Those who have not had their teeth cleaned in a long while may expect to experience a longer cleaning, and some additional pulling or scraping to remove plaque from teeth. Dental cleanings involve removing plaque and tartar deposits that have built up on the teeth over time. Your teeth are continually bathed in saliva which contains calcium and other substances which help strengthen and protect the teeth. While this is a good thing, it also means that we tend to get a build-up of calcium deposits on the teeth. This chalky substance will eventually build up over time. If the tartar is allowed to accumulate on the teeth it will unfortunately provide the right conditions for bacteria to thrive next to the gums. The purpose of the cleaning and polishing is basically to leave the surfaces of the teeth clean and smooth so that bacteria are unable to stick to them and you have a better chance of keeping the teeth clean during your regular home care. It also leaves your teeth feeling lovely and smooth and clean. Treatment time typically ranges from one to three years, depending on the growth of the patient’s mouth and face, and the severity of the problem. Patients grow at different rates and will respond variously to braces, so the time until case completion may differ from the original estimate. Interceptive, or early treatment procedures, may take as few as six months. Invisalign® uses a series of invisible, removable, and comfortable aligners to straighten your teeth. And, no one can tell you are wearing Invisalign because it’s invisible! Not only are the aligners invisible, they are removable, so you can eat and drink what you want while in treatment, plus brushing and flossing are less of a hassle. The aligners are comfortable and have no metal to cause mouth abrasions during treatment. Please visit our Invisalign page to learn more. When you need to replace missing teeth, you want something as close to natural teeth as possible. Dental implants represent the state-of-the-art in dental technology, making it possible to restore your smile to its natural state. Dental implants are the only solution that replaces the entire missing tooth and preserves the supporting bone, making them the preferred choice over fixed bridges or removable dentures. Dental implants are designed to provide a foundation for replacement teeth that look, feel, and function like natural teeth. The person who has lost teeth regains the ability to eat virtually anything and can smile with confidence, knowing that the teeth will appear natural and that facial contours will be preserved. The implants themselves are tiny titanium posts that are placed into the jawbone where teeth are missing. The bone bonds with the titanium, creating a strong foundation for artificial teeth. In addition, implants can help preserve facial structure, preventing the bone deterioration that occurs when teeth are missing. Do not ignore a missing tooth! Each tooth plays an important role in your oral health. Once you lose a tooth, the immediate solution is to replace it, especially if it is not a front tooth. Any missing tooth can have a negative impact on your quality of life, as well as dental and oral health. When we chew, a healthy tooth strengthens the quality of the bone; similar to how exercise protects against bone loss, affecting how our upper and lower teeth meet. Dental implants are accepted by dental professionals for over 40 years, as a successful and trusted method of tooth replacement used today, act like your natural tooth root. You do not feel the difference. Implants are made of bio-compatible materials. As a result, they are accepted by your body. Your implant can actually last a lifetime with proper care and good oral hygiene. They are also minimally invasive; your adjacent healthy teeth are untouched. Unlike conventional bridges, there is no need to grind down adjacent natural teeth. They help maintain natural bone, and minimize further bone loss due to bone stimulation – one of their most important advantages. Implants also provide stability and comfort, with no adjustment necessary after placement. Invisalign takes a modern approach to straightening teeth, using a custom-made series of aligners created for you and only you. These aligner trays are made of smooth, comfortable and virtually invisible plastic that you simply wear over your teeth. Wearing the aligners will gradually and gently shift your teeth into place, based on the exact movements your dentist plans out for you. There are no metal brackets to attach and no wires to tighten. You simply pop in a new set of aligners approximately every two weeks, until your treatment is complete and you achieve the confident smile that you’ve always wanted. The best part about the whole process is that most people won’t even know you’re straightening your teeth. Developed by internationally renowned cosmetic dentist and bleaching expert Dr. Rod Kurthy, the KöR Whitening Deep Bleaching™ System is considered to be the most reliable and effective bleaching system ever developed. • Permanent results – white teeth for your lifetime! KöR® Whitening Deep Bleaching™ is the most effective whitening system in the world today. KöR Whitening is the only system recognized to significantly whiten even difficult tetracycline stained teeth within a short time. KöR Whitening is available for at-home only whitening, and Deep Bleaching system which includes one or two in-office whitening visits and at-home whitening. Most dentists providing teeth whitening have found frustration after frustration, in terms of predictability, effectiveness, longevity of effect and complaints of sensitivity by patients. Dentists who have whitened the teeth of teenagers have found that the teeth routinely become white very quickly, whereas the teeth of geriatric patients are seemingly impossible to whiten well. Over years stains from foods become intrinsic within the teeth, working their way deeply into the microstructure of the enamel rod complex. The space among the enamel rods becomes solidly packed with stain debris, preventing peroxide byproducts from penetrating the microstructure of the tooth. The result is minimal and unpredictable results. KöR Whitening Deep Bleaching™ Trays seal both saliva and sulcular fluid out of the whitening trays. Deep Bleaching Trays in combination with KöR® Whitening gels provide a full 6+ HOURS of whitening activity compared to the typical 25-35 minutes. The result is a thorough cleansing out of debris from between enamel rods, rejuvenating the enamel, more closely resembling that of a young person, and of course amazing whiteness. This is just the start of Deep Bleaching. A final in-office whitening session with more concentrated peroxide results in the ability of the peroxide byproducts to actually flood into the now refreshed microstructure of the teeth, finishing the degradation of any remaining stubborn stains, providing the most WOW result you have ever seen. Of course there is much more to KöR® Whitening Deep Bleaching™, including the various whitening gels specifically designed with the exact physical properties to work best with his Deep Bleaching protocol, constant refrigeration of the entire KöR line of whitening products from the instant of manufacture until received by the dental practice, and the most effective anti-sensitivity approach ever seen. A filling may also be needed to replace or repair an old worn down existing filling or to fix a chipped tooth. In addition to potential pain and discomfort and possible tooth loss, if you wait to have your cavity filled it may end up requiring a more difficult process, such as a root canal, to save your tooth. And it could also cost you a lot more money to fix. We recommend you should get your cavity filled as soon as you can. What Is A Cavity? Why Did I Get One? Composite is the filling material of choice when it comes to matching your tooth color. Composite fillings consist of plastic and glass particles. They have become the most popular filling materials because they can match your existing tooth color and they also solidly bond or glue to the tooth. After the decay in your tooth has been cleaned a cleansing gel is applied. Next a bonding solution is applied, finally followed by the composite filling material. Composite is hardened by applying a high intensity blue light. It only takes a few seconds for the materials to harden. Once the tooth is filled and the composite has hardened, the filling is checked to insure the proper shape and look. At this point any necessary adjustments are made and then your filling is complete. One of the most popular options in restorative cosmetic dentistry today are veneers. Veneers are made of thin, durable porcelain material and can provide natural looking, long lasting results. Veneers recreate your smile by concealing damage or defects on the fronts and sides of your teeth. Veneers can correct the appearance of stains, chips, breaks and cracks, oddly shaped or permanently discolored teeth and unsightly fillings. 2. Trauma or other event: tooth injured, root canal treatment, stains from tetracycline or other drugs, excessive fluoride present in a child’s diet, etc. • Teeth that are worn down from grinding (bruxism). • Teeth that are chipped or broken. • Teeth that are misaligned, uneven, or irregularly shaped. • Teeth with gaps between them. A bridge may be recommended if you’re missing one or more teeth. Gaps left by missing teeth eventually cause the remaining teeth to rotate or shift into the empty spaces, resulting in a bad bite. The imbalance caused by missing teeth can also lead to gum disease and temporomandibular joint (TMJ) disorders. Bridges are commonly used to replace one or more missing teeth. They span the space where the teeth are missing. Bridges are cemented to the natural teeth or implants surrounding the empty space. These teeth, called abutments, serve as anchors for the bridge. A replacement tooth, called a pontic, is attached to the crowns that cover the abutments. As with crowns, you have a choice of materials for bridges. Your dentist can help you decide which to use, based on the location of the missing tooth (or teeth), its function, aesthetic considerations and cost. Porcelain or ceramic bridges will be matched to the color of your natural teeth. A root canal is a treatment used to repair and save a tooth that is badly decayed or becomes infected. During a root canal procedure, the nerve and pulp are removed and the inside of the tooth is cleaned and sealed. Without treatment, the tissue surrounding the tooth will become infected and abscesses may form. “Root canal” is the term used to describe the natural cavity within the center of the tooth. The pulp or pulp chamber is the soft area within the root canal. The tooth’s nerve lies within the root canal. A tooth’s nerve is not vitally important to a tooth’s health and function after the tooth has emerged through the gums. Its only function is sensory — to provide the sensation of hot or cold. The presence or absence of a nerve will not affect the day-to-day functioning of the tooth. A tooth’s nerve and pulp can become irritated, inflamed, and infected due to deep decay, repeated dental procedures on a tooth, and/or large fillings, a crack or chip in the tooth, or trauma to the face. A tooth that is severely damaged may need to be removed. Extractions are performed for a wide variety of reasons, including tooth decay that has destroyed enough tooth structure to render the tooth non-restorable. Extractions of impacted or problematic wisdom teeth are routinely performed, as are extractions of some permanent teeth to make space for orthodontic treatment. We will do everything we can to reduce your stress and anxiety so that your tooth removal is as quick and simple as possible. After the tooth has been removed, it’s always best to replace the gap it creates with dental bridge work or a dental implant. Not only does this permit normal eating, chewing, and smiling, it eliminates an ugly gap into which the other teeth may drift. This movement of teeth can create nooks and crannies that can harbor bacteria, trap food, and lead to disease.